The future of the Lumia 1020 - another sidelined classic like the 808? We saw this in action for Nokia's N93 - the original 'transformer' Symbian phone that could look like a regular T9 clamshell or a consumer camcorder at will. It tested well amongst geeks and camera phone enthusiasts but made no mark whatsoever in the consumer marketplace of the time (2006). 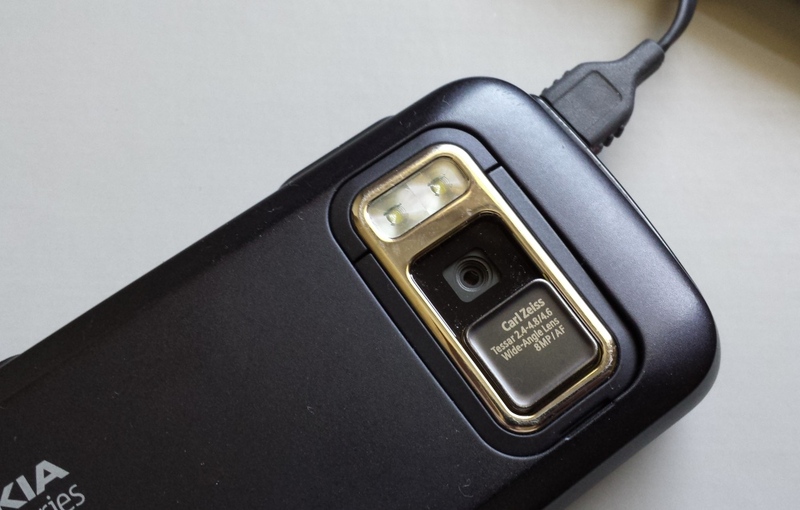 The best-selling N95 escaped the 'camera-centric' tag because it had so many other innovations, of course, the integrated GPS, the GPU, the high quality stereo speakers, and so on. The we run forward to the Nokia N82, from 2007/2008, the first smartphone with a Xenon flash, very definitely a 'camera phone' first and foremost. And still a device with just about the brightest Xenon illumination in the world, even after 7 years. But, despite appearing in High Street shops, it didn't sell in huge numbers. Repeat the process with the N86, the first High Street smartphone with an 8MP camera and still unique in having variable aperture, the first to use intelligent digital zoom when capturing video and to use a digital microphone. So many innovations, yet the N86 also failed to set the sales charts alight, this time in 2009. Next in line, the aluminium-bodied N8, at the end of 2010, with 12MP and Xenon flash and a, for the time, huge sensor. Sales started off well, using the new GPU-accelerated Symbian^3 platform, but then Nokia's Stephen Elop (prematurely) shot Symbian down on stage at MWC 2011 as part of the demonstration of support for Microsoft and Windows Phone, and the N8 never recovered. Finally, on the Symbian front, we had the all-conquering Nokia 808 PureView, the result of five years of R&D, learning lessons from all the devices above, offering what's still (by far) the largest camera sensor in any phone, with 41MP sensor into which users could 'zoom', digitally, without losing light or quality, and with hardware oversampling producing noiseless, pure images at lower resolution by default. Released in spring 2012, a full year after Symbian's execution, it's clear that the only reason this still made it to market was that so much work had already been done on the hardware and it would have been criminal to not at least shown it off to the world. At least, not without a Windows Phone version ready, something which was still a year away. As a result, in the world of 2012, with Symbian's 360p screens seeming blocky compared to WVGA and 720p and with Android really taking off at the high end, and with Symbian utterly frowned on within High Street shops, the Nokia 808 PureView remained something of a cult hit only. If there's a common thread in all the above, it's the inescapable conclusion that it takes time to create a really good phone camera. The space, weight and power constraints place extreme pressures on designers and in each case, by the time the phone hit the market, the underlying hardware was nearing the end of its relevance in the wider smartphone world. For example, the N82 was a full year after the N95 which had essentially the same internals, the N86 was a device and form factor from a bygone age even when launched, the N8 was legendarily delayed by up to a year, the 808 was borne into a completely hostile future. What, then, does the future hold for the Lumia 1020? There's no doubting that it fared better, in terms of sales, than its Xenon-equipped, large-sensored 41MP ancestor, the Nokia 808, but with quite a few new software releases from Nokia/Microsoft explicitly saying that they're only for the Lumia 1520 and 930, worries are starting to creep in for 1020 fans. The Lumia 1020 does stand out a little, amidst its peers, by having the extra Gigabyte of RAM, needed to handle the processing of the (up to) 38MP full resolution bitmaps internally, but the RAM will hopefully come in handy in helping ensure that the 1020 is less likely to be left behind when it comes time to update the Windows Phone platform again. So far we're seeing no device left behind by Microsoft, thanks in part to Windows Phone's comparatively low hardware requirements - most of the work is in finishing code, adding functions and fixing issues and compatibility, all without adding much to 'bloat'. As a result, even the lowest Lumia 520 is getting the full Windows Phone 8.1, though some of the higher end camera-related functions are starting to come with some hardware requirements. Historically this has been done according to RAM, though with 2GB on board the Lumia 1020 should be good in this regard for another year or two at least. Processor and GPU speed are more of an issue, with the latest features in Nokia Camera/Storyteller being limited to just the Lumia 1520 and 930 - at least in theory. 'Living Images' worked pretty well under the original Nokia Camera Betas on the 1020, so maybe these can be worked in again, in an update? Certainly Nokia seems to have standardised on a 'good enough' 20MP cut down version of the PureView technology. Which is fair enough - and results are good - but it doesn't stop the cameraphone geek in me wanting a third in the 41MP series. Is it just me? What of the core OS though - at what point will Microsoft start lopping off device compatibility? Windows Phone 8.1 Update 1, rumoured to roll out to developers for early testing later this month (July), for eventual release over the air to consumers in November/December, is supposed to be a fairly minor update (by comparison to 8.0 to 8.1) and should also be available for all devices. Windows Phone 8.1 Update 2 is scheduled to be available for testing around the end of 2014 and is likely to include new features to support new hardware, and I'd expect much of the lower end of the current Lumia range to get this update but not the full feature set. Whatever comes after that is pure conjecture (Google 'Threshold' if you want more on the rumours) and depends very much on Microsoft's ongoing plans to unify its platforms, but it's a fair bet that Windows Phone 8.2 (or Windows Phone 9, or whatever it ends up being called) will be optimised for the Snapdragon 800 and higher. Will the Lumia 1020 be updated for this release? My guess is 'no', but with the extra RAM, who knows? It might go down to the wire and depend on how many 1020-owning enthusiasts there are in early 2015 at Microsoft! So - the Lumia 1020 stands a chance of being updated for longer than its older sister devices, the 920 and 925 - but only a slender one. Having said that, the 1020 will, by the time WP9/Threshold/whatever hits, be two years old and will have enjoyed updates freely throughout that time, adding significant extra general functionality that certainly wasn't there when customer bought the device. The Lumia 1020, like the 808 before it, still has unique selling points (in terms of photo quality, reframing/zooming flexibility and low light shots of people), and it seems that we still have at least another year of updates ahead. So celebrate the 1020 and don't give up on it. And don't you dare sell the Lumia 1020. Those who sold on the Nokia 808 PureView have bitterly regretted it - these devices are classic of modern tech engineering.